I have been working on a gallery wall in our family room. Right across from my desk nook. The only thing that was hanging on the wall was an oversized chalkboard. I kept the cottage beach theme. I put together family pictures from our outings at Nantucket. found a Nantucket sign. I was so excited. 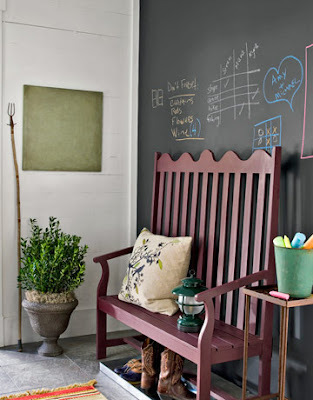 never changed the wall style in our family room so I opted for a small chalkboard. Love this picture. It looks so inviting. Here is my gallery wall in our family room. Sorry for the phone camera pictures. Ran out of battery on my camera. 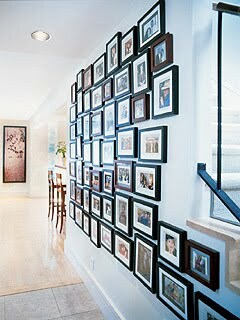 I love your gallery wall it's so nicely spaced! I'm really in to white frames right now. Your Nantucket sign is a real gem! I really like it! And that sign is perfect for it. Well done! Hi, just found your blog. You had me at the dragonfly! I'm currently working on a gallery wall. Thanks for the inspiring pictures! I love the mix, with the photos, your great Nantucket sign, and the colorful fish!! I am in LOVE with the Nantucket sign!!!! What a great find! The gallery wall looks fabulous! I have had frames leaning up against my wall waiting to hang for MONTHS!!! Why can't I just get them up? ARG! Now is it an antique or a new to look old? Such a nice addition to the family photos. I love white frames too and yours look wonderful, but best of all is the memories that come with the pictures and I can't wait to do our hall too! It's a new sign made to look old. I just thought it was perfect on what I was trying to do with the wall of pictures.